Ayers Rock, Uluru, the world's largest monolith and an Aboriginal sacred site, is Australia's most famous natural landmark. The rock is part of the Olga mountains located in Kata Tjuta National Park which is 280 miles (450 km) southwest of Alice Springs. I took a bus ride to the Rock and climbed with many other tourists. I made the tough 1.6 km ascent to the top about twenty years ago when I learned about its importance in dreamtime legend from lectures by aboriginals on a trip to Australia in 1992. 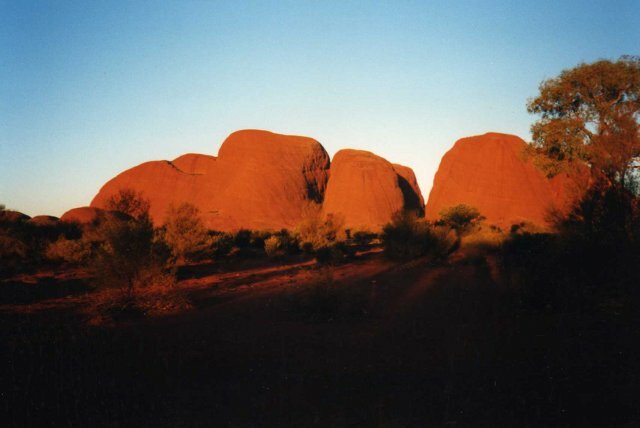 In this enormous park are many Aboriginal sacred sites, spectacular scenery and famous rock formations. The Olgas (Kata Tjuta) is a dramatic series of 36 dome-like rock formations which stand up to 1,701 ft (546 m) high and cover an area of 35 km and like Uluru, produce an incredible light show at sunset, with crimsons turning to rusts, and pinks to mauves. The rock and the ground around it is sacred to the local Aboriginal people and traditional owners have wanted the climb closed since the land was handed back to them in 1985, a spokesman said. 'You can't go and climb on top of the Vatican, you can't go and climb on top of the Buddhist temples and so on and so forth. He said tourists would still be able to get information from walking around the rock's five-mile circumference and listening to stories Aborigines have to tell about it. They believe many parts of the rock, including its waterholes, cliff faces and caves, were shaped by giant creatures who lived in a mythical period they refer to as their Dreamtime.